UPDATED: Gary Locke resigned as Secretary of Commerce on August 1, 2011 to become the U.S. Ambassador to the People's Republic of China. John Bryson is the current Secretary of Commerce and was appointed by President Obama and sworn into office on October 21, 2011. 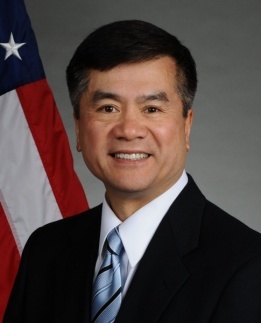 Gary Locke was appointed by President Obama as the 36th Secretary of Commerce and sworn into office on March 26, 2009. At the Department of Commerce, Locke is charged with helping implement President Obama's ambitious agenda to turn around the economy and put people back to work. In particular, Locke is the administration’s point person for achieving the President’s National Export Initiative, which seeks to double U.S. exports by 2015, in support of several million American jobs. As Commerce Secretary, Locke has presided over a 17 percent increase in exports, compared to 2009. He also led the administration’s first Cabinet-level trade mission – a clean energy mission to China and Indonesia in May 2010, while the Commerce Department led an unprecedented 35 trade missions overall. Locke has co-chaired two sessions of the U.S.-China Joint Commission on Commerce and Trade that resulted in important changes to Chinese trade policy, helping to level the playing field for U.S. businesses exporting to and operating in China. Since taking the helm at Commerce, Locke has worked to significantly shorten the patent pendency period at the U.S. Patent and Trademark Office, overseen the installation or upgrade of approximately 5,000 miles of fiber lines as part of the high-speed Internet deployment program and helped bring the 2010 Census in under budget, resulting in $1.87 billion in savings to taxpayers. As the first Chinese-American to hold this post in a president's Cabinet, Locke has a distinctly American story. His grandfather emigrated from China to Washington state, initially finding employment as a servant, working in exchange for English lessons. Locke's father, also born in China, was a small business owner, operating a grocery store where Locke worked while receiving his education from Seattle's public school system. His strong work ethic and determination eventually took him to the highest office in the state of Washington. While serving as a popular two-term governor of Washington state, the nation’s most trade-dependent state, Locke broke down trade barriers around the world to advance American products. He helped open doors for Washington state businesses by leading 10 productive trade missions to Asia, Mexico and Europe, significantly expanding the sale of Washington products and services. He also successfully strengthened economic ties between China and Washington state. His visits are credited with introducing Washington companies to China and helping more than double the state's exports to China to over $5 billion per year. As part of his considerable trade and economic development efforts, Locke launched Washington’s Competitiveness Council with business, labor and civic leaders working together to effectively position Washington state for success at home and around the world. During the eight years of the Locke administration, the state gained 280,000 jobs. Prior to his appointment, Locke was a partner in the Seattle office of the international law firm, Davis Wright Tremaine LLP, where he co-chaired the firm's China practice and was active in its governmental relations practice. Locke earned a bachelor's degree in political science from Yale University and a law degree from Boston University. He is married to Mona Lee Locke. They have three children: Emily, Dylan and Madeline.